Check that the contents of your box are correct according to the model. Check operation of the code front plate. On models CL605, CL615 and CL625 a free passage function is available. This is identified by a black dot on the bottom left hand ’Z’ button. In normal operation the code needs to be entered every time to retract the latch. To put the lock into free passage mode, first press the random factory set code, followed by the passage set button. The lock will now be in code free access mode. To put the lock to code access only press the passage set button once followed by the C button. See code change instructions on separate sheet. The code may be entered in any sequence, ie 1370 may be entered as 0731 or any other sequence of those numbers. There are a total of 8,191 codes available on the CL600, CL610, CL620 and CL650 locks. There are 4,095 codes available on the CL605, CL615 and CL625 locks. 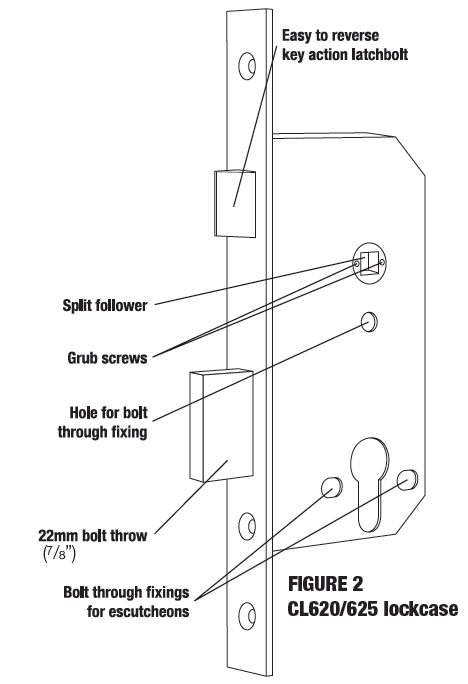 The model CL600/605 is intended to replace the conventional door furniture fitted to an existing mortice latch, or an existing mortice lock which has both a spring latch and a deadbolt. The square follower should be 8mm (5/16”) square. Any lock and key mechanism is retained to operate the deadbolt. The CL600/605 will only operate the latchbolt and not the deadbolt. 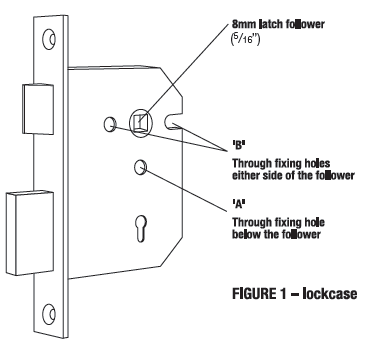 A mortice lock case should have holes for fixing bolts to pass through on either side of the square latch follower and sometimes, additionally, a hole below the follower. 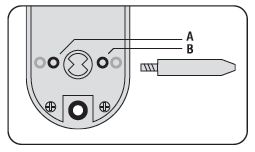 See figure 1 and confirm that your lockcase is compatible with the CL600/605 lock plates. Hold the neoprene seal with the three fixing holes against the door, vertically, with the rectangular hole centrally over the follower. Mark the top and bottom holes on the door face, and repeat the procedure on the other side of the door. Remove the lock. At three points drill a10mm (3⁄8”) hole through the door. Drill from both sides for greater accuracy and to avoid splintering out of the door face. Check that the existing spindle hole is at least 18mm (3⁄4”) diameter. Refit the lock. Important: When using CL600/CL605 front and back plates only, please test with your selected lock-case to ensure that the latch retracts fully from the code side without too much resistance. Some lock-cases have a heavily sprung latch follower designed for use with un-sprung lever furniture. This heavy springing can defeat the clutch on our locks. Please note the code chamber for mechanical locks requires the lever to be rotated at least 45 degrees to re-set the lock for the next code user. Please contact our Codelocks technical department if you are unsure. Codelocks Limited does not accept responsibility for products incorrectly specified. 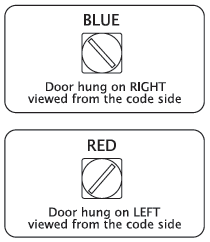 Take the BLUE or RED tipped spindle and fit to the code side according to the hand of your door (see diagram). Fit remaining spindle to inside - non code side. Cut three of the socket head bolts to the required length for your door. Approximate overall length should be door thickness plus 25mm (1”), to allow about 10mm (3⁄8”) of threaded bolt to enter the outside plate. Remove plastic insert plug from frontplate. Apply the front and back plates, with the neoprene seals in position, against the door, over the protruding ends of the spindle. Fix the two plates together using the socket head bolts, starting with the top fixings. Ensure that the two plates are truly vertical and then tighten the bolts using the ‘T’ shaped Allen key. Do not use excessive force. Fit the lever handles to suit the hand of the door. To change the hand of a lever handle, loosen the grub screw with the small Allen key, reverse the lever handle and fully tighten the grub screw. Ensure that the latchbolt retracts after the code is entered and the lever handle is depressed. Now check the operation of the inside lever handle. If there is any binding of the handles or latch then loosen the bolts slightly and reposition the plates until the correct position is found, and then re-tighten the bolts. Hold the neoprene seal against the door, perfectly vertically, with the rectangular hole centrally over the follower. Mark the top holes and the holes on either side of the follower if not already drilled, using adaptor plate as guide, then repeat the procedure on the other side of the door. Mark an extra hole on the inside of the door in line with the bottom fixing hole. Drill the 4 x 10mm (3⁄8”) holes from both sides for greater accuracy, and to avoid splintering out of the door face. Check that the existing spindle hole is at least 18mm (3⁄4”). Drill the extra 12mm (1⁄2”) hole 5mm (3⁄16”) deep on the inside of the door to accept the fixing nut on the adaptor plate. Take the adaptor kit, item 13 on the contents page. Cut the two M5 countersunk head bolts to length to suit the door thickness; i.e. door thickness plus a maximum of 10mm (3⁄8”) (no more than 5mm (3⁄16”) should enter the front plate). Hold the front plate, with the three hole neoprene seal, against the door over the protruding spindle. From the other side of the door, fix the adaptor plate to the front plate using the two M5 countersunk bolts. Before tightening up the fixings, make sure that the spindle hole is centrally positioned over the follower. Do not use excessive force. Cut two of the long socket head bolts to the required length for your door. Approximate overall length should be door thickness plus 25mm (1”), to allow about 10mm (3⁄8”) of threaded bolt to enter the front plate. Place the neoprene gasket over the adaptor plate. Use the screw with the ‘T’ shaped Allen key, to fix the back plate to the front plate through the TOP holes. Using the 20mm (3⁄4”) socket head bolt fix the back plate through the BOTTOM hole to the adaptor plate. Do not use excessive force. Check that the lever handles are correctly fitted for the hand of door. To change the hand of a lever handle, loosen the grub screw with the small Allen key, reverse the lever handle and fully tighten the grub screw. Before closing the door, enter the code and check that the latchbolt retracts when the lever handle is depressed. Now check the operation of the inside lever handle. If there is any binding of the handles or latch then loosen the top and bottom bolts and reposition the plates slightly until the correct position is found, and then re-tighten the bolts. The model CL610/615 has a tubular, deadlocking, mort ice lat ch a nd m ay be used as a new installation on a door, or where an existing latch is to be replaced. When installing on a fire door, fire kit is required. Please refer to instructions on page 12 and 13. Note: Ensure enough room for the latch support post Please align the template to suit the locks backset: 60mm (2 3⁄8​”) standard or 70mm (2 3⁄4”). Lightly mark a height line on the edge and both faces of the door, and on the door jamb, to indicate the top of the lock when fitted. Crease the template (standard) along the dotted line, and tape it to the door with the top in line with the height line. Mark the 3 x 10mm (3⁄8”) and the 1 x 30mm (1 3⁄16”) holes. Note: When fitting to a door with existing 54mm (2 1⁄8”) through hole, only top two 10mm (3⁄8”) holes need to be marked and drilled. Mark the centre of the door edge on the Centre Line of Latch. Remove the template and apply it to the other side of the door, aligning it accurately with the first Centre Line of Latch mark. Mark the 4 holes again. Note: Space required above latch body for cam to rotate. Keeping the drill level and square to the door, drill a 25mm (1”) hole in centre of door edge, deep enough to accept the latch. Keeping the drill level and square to the door, drill the 10mm and 30mm (3⁄8”- 1 3⁄16”) holes from both sides of the door to increase accuracy and to avoid splintering out the door face. Put the latch into the hole and, holding it square to the door edge, draw around the faceplate. Remove the latch and score the outline with a Stanley knife to avoid splitting when chiselling. Chisel a rebate to allow the latch to fit flush to the surface. Fix the latch with the wood screws, with the bevel towards the door frame. Fitting the strike plate. N.B. The plunger beside the latchbolt deadlocks it, to protect against manipulation or ‘shimming’. The strike plate must be accurately installed so that the plunger CANNOT enter the aperture when the door is closed, even if it is slammed shut. Position the strike plate on the door frame so that it lines up with the flat of the latchbolt, and NOT the plunger. Mark the positions of the fixing screws, and draw around the aperture of the strike plate. Chisel out the aperture 15mm (3⁄8”) deep to receive the latchbolt. Fix the strike plate to the surface of the frame using only the top fixing screw. Gently close the door and check that the latchbolt enters the aperture easily, and is held without too much ‘play’. When satisfied, draw around the outline of the strike plate, remove it and cut a rebate to enable the faceplate to lie flush with the surface. Re-fix the strike plate using both screws. Fit the latch support post into back of the code side front plate according to the hand of your door, A for a right hand door, or B for a left hand door (see diagram). Cut three of the socket head bolts to the required length for your door. Approximate overall length should be door thickness plus 25mm (1”) to allow about 10mm (3⁄8”) of threaded bolt to enter the outside plate. Apply the front and back plates, with the neoprene seals in position, against the door, over the protruding ends of the spindle. Fix the two plates together using the socket head bolts, starting with the top fixing. Ensure that the two plates are truly vertical and then tighten the bolts using the ‘T’ shaped Allen key. Do not use excessive force. Before closing the door, enter the code and ensure that the latchbolt will retract when the lever handle is depressed. Now check the operation of the inside lever handle. If there is any binding of the handles or latch then loosen the bolts and reposition the plates slightly until the correct position is found, and then re-tighten the bolts. The model CL620/625/650 has a mortice lock and may be used as a new installation on a door, or where an existing lock is to be replaced. A. When necessary the hand of the latchbolt can be changed by removing the three screws holding the faceplate to the lockcase, reverse the latchbolt, and tighten the screws back up, ensuring that the latchbolt is central. B. Put the key in the cylinder and insert it centrally into the lockcase. Fix it in position with the long bolt through the faceplate. It should now be possible to project and retract the deadbolt with the key, and also to retract the latchbolt. C.The square latchbolt follower is in 2 parts: the inside ‘panic function’ follower will retract the latchbolt and also the deadbolt when it is projected. The effect of this is to ensure that it is not possible to accidentally lock someone in a room because the deadbolt is projected. The outside follower will always retract the latchbolt whenever the lever handle is depressed after a correct code is entered, but it will not retract the deadbolt. The hand of the ‘panic function’ is determined as follows: the grub screws on the split follower facing the code side must be removed. This prevents the outside handle retracting the deadbolt. Never remove grub screws from both sides at the same time. All door locks should be installed with a degree of precision to ensure that all components are horizontally and vertically accurate in relation to each other, and in relation to the door. Do not install the lock where it will involve cutting into a joint between the door stile and a mid-rail. Lightly mark a height line on the edge and both faces of the door, and the door jamb, to indicate the top of the lock when fitted. Mark a line down the centre of the door edge, extending above the height line and 300mm (12”) below it. Hold the template against the edge of the door with the top in line with the height line, and with the arrows in line with the ‘Centre of Door Edge’ line. Mark the positions of the fixing holes, and the holes to be drilled for the mortice. Apply tape to the 16mm (5⁄8”) drill bit at 90mm (3 9⁄16”) from the tip to act as a depth guide when drilling the mortice holes. Ensure the drill is level and parallel to the door face and drill the holes as indicated on the template. Remove the remaining wood with a chisel to leave a clean mortice hole which accepts the lockcase without forcing. With the lock in the mortice make sure that the forend is parallel with the door edge and mark the outline of the forend plate. Cut the outline with a Stanley knife to avoid splitting out when chiselling. Chisel a rebate sufficient to accept the forend flush with the surface. Fold the template accurately along the dotted line and tape it to the door face with the top in line with the height line, and the fold on the door edge. Mark the centres of all the holes to be drilled. Remove the template and repeat the procedure on the other face of the door. Drill the holes from both sides of the door to improve accuracy and to avoid splintering out the door face. Install the lockcase in the door. 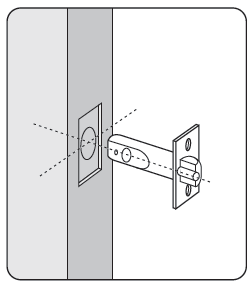 Before closing the door, enter the code and check that the latchbolt will retract when the lever handle is depressed. Now check the operation of the inside lever handle. If there is any binding of the handles or the latch then loosen the bolts and reposition the plates slightly until the correct position is found, and then re-tighten the bolts. Fit the double Euro-profile cylinder and secure it with the long screw through the faceplate. Fit the cylinder escutcheons. 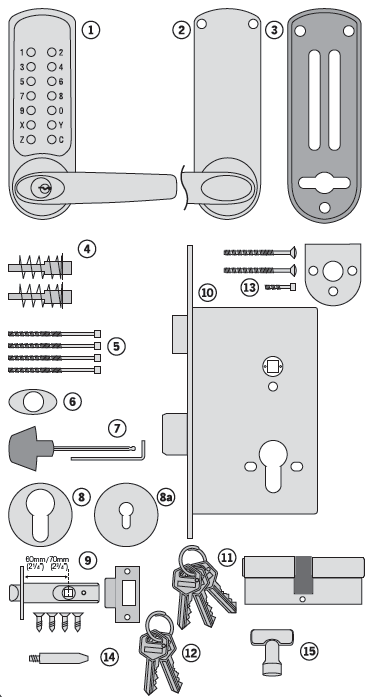 Check that the deadbolt will project and retract by key, and that the key will also retract the latchbolt. Check that the inside lever handle WILL retract the deadbolt simultaneously with the latchbolt. Check that the outside lever handle WILL NOT retract the deadbolt. Mark a vertical line on the door jamb half the door thickness away from the door stop. This gives the centre line of the strike plate. Align the Strike Plate Template with the height line, with the arrow heads aligned with the centre line. Mark the fixing holes, and draw around the apertures for the latchbolt and the deadbolt. Chisel out the latch aperture to 12mm (1⁄2”) deep, and the deadbolt aperture to 22mm (7⁄8”) deep. Fix the strike plate with the top screw only and gently close the door. Ensure that the latchbolt enters its aperture easily and holds the door without too much ‘play’. When satisfied, draw around the final position of the strike plate, remove it, and cut a rebate to allow it to fit flush to the surface. Re-fix the strike with both screws. Take time to be precise and finish the job quicker. Installation holes must be drilled in exactly the correct positions and precisely at right angles to the door surface. Lock components must be vertically and horizontally accurate in relation to each other and to the door. Wedge the door firmly to prevent movement whilst drilling and chiselling. Lightly mark a height line on the edge and both faces of the door and on the door jamb, to indicate the top of the lock when fitted. Crease the template (fire) along the dotted lines and tape it to the door with the top in line with the height line. Mark the holes to be drilled. Mark the centre line of latch on to the door edge. Apply the template to the other side of the door precisely against the height line and the centre line of latch mark. Mark the holes to be drilled again. (See diagram A). Keeping the drill level and straight, drill a 25mm (1”) hole in the centre of the door edge to accept the latch. Put the latch into the hole and holding it square to the door edge, draw around the faceplate. Remove the latch. Starting with the top and bottom cuts, chisel a rebate to allow the latch faceplate to fit flush with the door edge. Keeping the drill level and straight, drill the holes in the door face. Drill from both sides of the door to increase accuracy and to avoid damage to the other side when a drill goes right through. Insert the fire cup into the 54mm (2 1⁄8”) hole. N.B. open side of the fire cup to face code side with small bolt through hole at the bottom. Reinsert the latch and fix the screws, with the bevel towards the door frame. (See diagram B). Fit the spindles to the latch according to the hand of your door. Fit remaining spindle to inside - non code side. (see diagram below). Install the spindle washers (item 3) over the flat blade of both spindles. Use enough washers so they sit flush to the face of the door without bind when the Codelock is installed. Fit the latch support post to hole adjacent to A for a left hand door, and adjacent to B for a right hand door. Screw the fixing posts (item 1 on page 13) into the front plate. 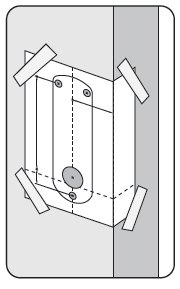 Place the outer cover plate to the door with the inner cover plate (item 4) using the three fixing bolts (item 5). Fix the front plate to the door with the inner cover plate (item 4) using the three fixing bolts (item 5). Fit the inside handle body to the inner cover plate using the three short fixing bolts (item 6). A) The CL600 range is available in Back to Back versions where the code is on both sides of the door. Follow instructions as for non back to back versions substituting the backplate and handle 2, with the coded plate with the through fixing holes. Please note that each side may be coded with the same or different codes. B) The CL600 range is also available to work with most single point panic pads or bars. In this format the front code plate only is supplied with suitable fixing to connect to most single point panic pads and latches. If in doubt ask. The position of the CL600PK on the door is determined by the position of the panic device. Mark the position of the spindle hole for the panic device on both sides of the door. Place the CL600PK gasket against the door with the 20mm (3⁄4”) hole centred over the mark for spindle hole. Using the gasket as a template mark the 3 x 10mm (3⁄8”) holes for the through fixing bolts. Repeat on the other side of the door. Drill the 1 x 20mm (3⁄4”) hole and the 3 x 10mm (3⁄8”) drilling holes, from both sides to avoid splintering out the face of the door. Countersink the bottom fixing hole as necessary so that the fixing bolt lies flush with the door face, underneath the panic device. Fit the lever handle to the CL600 front plate and tighten the grub screw in the handle. Enter the code of the CL600 front unit and check that the lever will turn fully – see page 6. operation check. Fit the CL600 front unit with the 3 fixing bolts. Insert the spindle with the flat blade into the CL600 front unit, ensuring that the blade is at the correct angle for the hand of door - see diagram page 8. Install the panic device and make sure that the CL600 front unit will fully retract the latch or bolt.